“… We just can’t seem to #communicate! I don’t know what’s wrong with you.” Such were the sentiments of one person to the other. Being on the same frequency as someone that you’re attempting to communicate with, is essential for the transmission of your thoughts and ideas; it’s also pertinent for the assembly of the other person’s thoughts and ideas. If you’re not on the same frequency, at best you’ll misconnect, at worse, you can destroy a relationship. As my astute friend and thought leader David Dadian, CEO of #Powersolution states when referring to frequency, there’s a commonness to the words one uses when communicating with someone else. 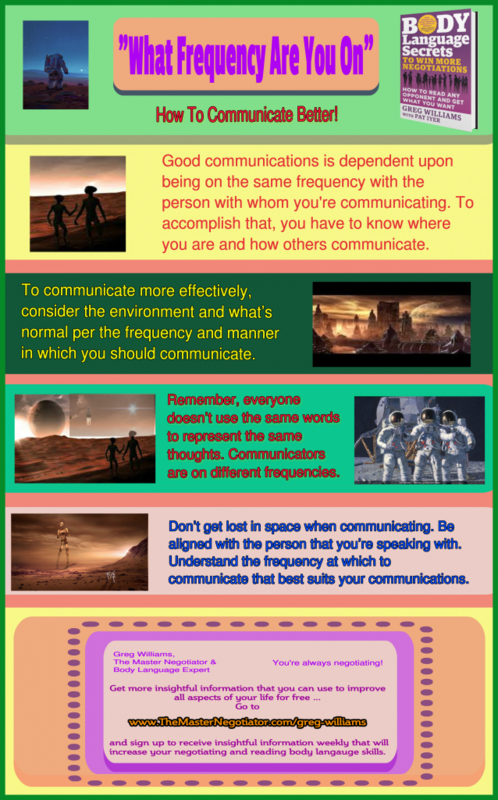 That commonness enhances the communications; that, in turn, decreases the incidents of #miscommunications. Thus, when people are on the same frequency, they’re communicating on the same level, they’re tuned to the same station, the same network. One is not at 97.5, while the other is at 107.2. One way to determine that you’re on the same frequency is by the energy level you experience. A higher energy level of experience denotes a positive flow, while a low level can be the signal of miscommunications. A low level also tends to drain people of their energy. The next time you’re engaged in what you determine to be a serious conversation, note the level of energy present. Even if you’re discussing something of sorrow or glee, they’ll be a degree of energy that’s locked into the exchange of thoughts and ideas. As long as you can relate that energy to being on the same frequency, you’ll know, at least, that you’re really communicating with the other party. If you observe a whimsical appearance, displays of confusion, or any sign that the person with whom you’re speaking is not getting your message, that will be an indication that there’s a frequency mismatch. That should also serve as a signal to reconnect; you’ve lost your WiFi. When it comes to frequency, the better you and your partner are attuned to the same station, the greater the chance you’ll communicate at a higher level than otherwise would be the case … and everything will be right with the world. In every negotiation, the outcome rest on your ability to communicate effectively with your counterpart. Some people don’t communicate as efficiently, because they allow mitigating circumstances to sideline their efforts. That can come in the form of not liking someone appearance, ethnicity, gender, etc. To enhance your negotiation efforts, be attentive to the distractions that might prevent you from being on the same frequency as your negotiation partner. When both of you reach that plateau, you’ll sense it. It’ll be like the two of you just click when exchanging offers and counteroffers. That’ll also be the time to pursue your negotiation objectives more fervently. That’s the power of being on the same frequency. You and the other negotiator will hear the same things, and you’ll be using common words to speak the same language. The post “What Frequency Are You On” – Sunday Negotiation Insight appeared first on The Master Negotiator & Body Language Expert.